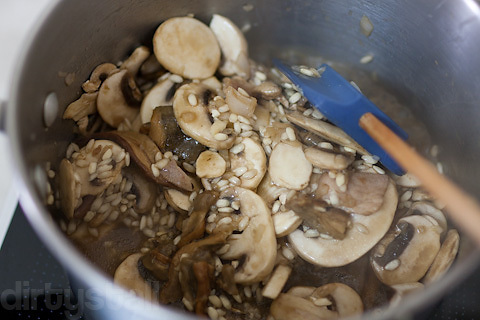 To make risotto al funghi, the key ingredient to it is the porcini mushroom. 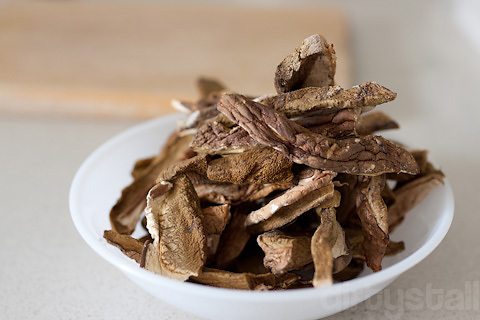 It is the king of European mushrooms, known scientifically as boletus edulis, and the robust aroma of the dried porcini mushroom can be really so intense. To prepare it, soak them in lukewarm water for about half an hour or so. 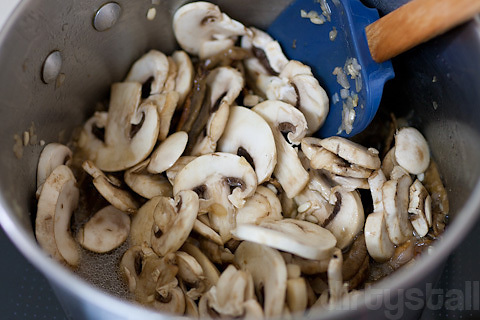 After that, squeeze as much water out of the reconstituted mushrooms then filter the mushroom stock with a cheesecloth. Rinse the mushrooms and set aside. Bring the mushroom stock close to boiling point. Got my mise en place ready! Making the risotto follows the basic white risotto recipe but the stock used is beef stock for the first 10 mins, then switching to the mushroom stock until it’s used up and back to beef stock. Besides adding the reconstituted porcini mushrooms, I also added some white mushrooms although in the end I think it wasn’t necessary. The porcini mushrooms have a meaty, savoury taste which brings to mind the taste of bacon, and the porcini stock imparts a musky, earthy aroma to the risotto. 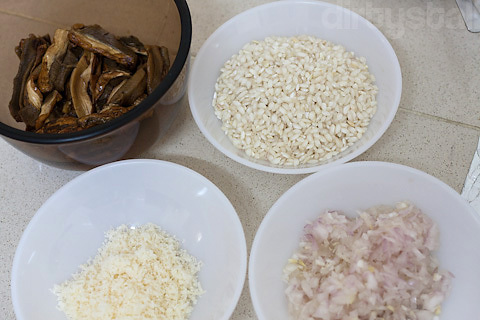 It all comes together for one delicious risotto! 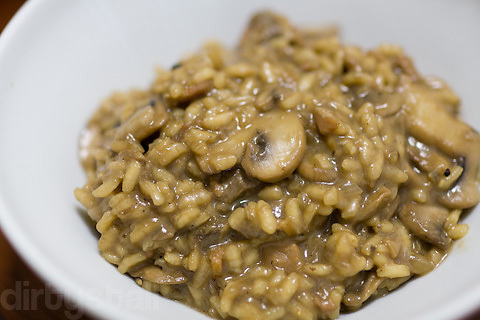 21 Responses to "Risotto al funghi"
Have you experimented with fresh porcini before? 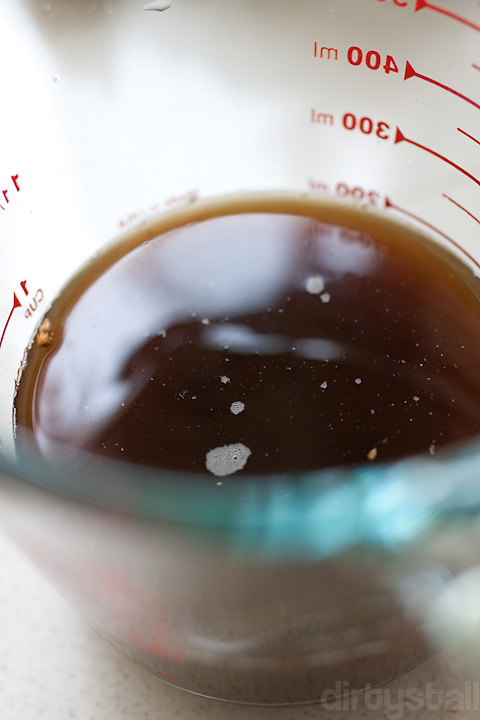 It’s alot less umami & imparts very little flavor to dishes. Quite difficult to find in supermarts. The dried ones are much more intense in flavor. Hahaha you can go risotto hunting again! I looove mushrooms, porcini especially. We used to go picking them in the woods in the fall, then clean, thread and dry over the stove. The aroma filling the house was intoxicating especially in a good year when we’d get 5 or more kilos each weekend. Love tge recipe too, simple but delicious, I can imagine the wonderful smell and taste! Oh yeah the aroma of dried porcini is just so intense and intoxicating! Fabulous looking risotto. Great job! I can’t wait to try this. I’ve never used a beef broth in risotto, but this combo makes perfect sense. Yeah the meaty flavour works well with the porcini aromas! 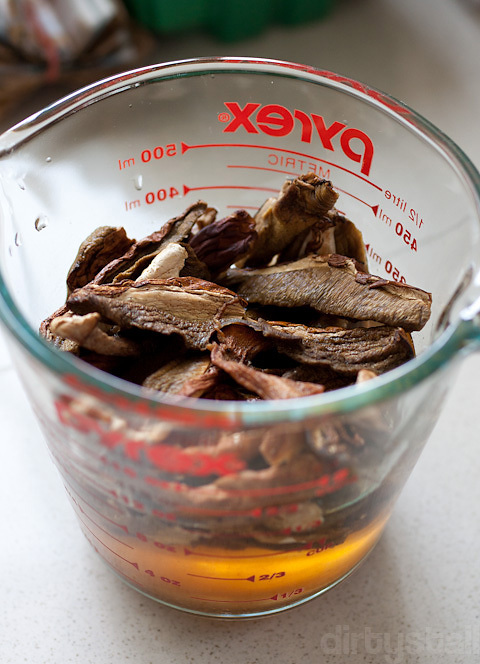 never thought of using beef stock until i saw this … and using mushroom stock too, been usuing just chicken stock and shitake mushrooms all this while. 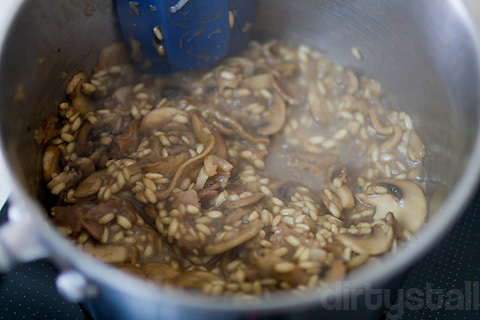 I love that earthy colours in your risotto, it indicates how lovely the mushroom flavours are in that dish! just pop by to say I have been checking out ur blog quite often, been waiting for the next post! Hey thanks for your concern and visiting my blog! I’ve been really busy and I’ve actually got quite a number of posts to do but no time to write them haha! Hopefully I can get more of them out soon. same here, I did have quite a number of backlog to clear. stretching to 1 month.